Chrystia Freeland is the editor of Thomson Reuters Digital and frequent panelist on KCRW’s Left, Right and Center, a political podcast I listen to weekly. I’ve always found her very incredibly well-informed, insightful, and non-dogmatic (rare in political media). I have a bit of a crush on her brain, so I was looking forward to this book. It doesn’t disappoint. This is not a populist bashing of the privileged, as the subtitle might lead one to believe. Rather, it’s an an examination of their lifestyle, the source of their wealth, the impact it has on the global economy and whether the massive income divide is good for society as a whole. She examines the good that the super-rich can do through job creation, innovation and philanthropy as well as the negative impacts of the increasing wealth gap. The titular plutocratic class are not just the 1 percent. They are the 1 percent of the 1 percent. The wealthiest .01 percent. A global elite whose nearest historical parallel is the robber barons of the Gilded Age, the Carnegies and Rockefellers who capitalized on the industrial revolution to generate aristocratic wealth. Modern robber barons have capitalized on a conflux of similar revolutions: the information revolution, the financial revolution (i.e. deregulation) and globalization. Freeland examines each of these trends and how together they create an abundant, cheap labor force, global market opportunities and a financial system that is configured to turn money into more money. Hence, we see not only a growing disparity between the 1 percent and everyone else, but within that elite group there is a growing disparity between the super-wealthy and everyone else. Wealth increases exponentially. The super-rich is not a totally homogenous group. However, Freeland makes a few key observations about them as a class. They are not, for the most part, inheritors of great wealth. Through a combination of smarts, business acumen, ambition, opportunity and varying degrees of luck, most of them have created their wealth. And they live a global lifestyle, often possessing homes in several countries, often maintaining a ridiculous travel schedule, and often identifying with each other more than any home or nationality. We celebrate income disparity and we applaud the growing margins between the bottom 20% of American society and the upper 20% for it is evidence of what has made America a great country. It is the chance to have a huge income…Do we feel bad for the growing gap between the rich and the poor in the U.S.? Of course not; we celebrate it, for we were poor once and we are reasonably wealthy now. We did it on our own, by the sheer dint of will, tenacity, street smarts and the like. That is why immigrants come to the U.S.: to join the disparate income earners at the upper levels of society and to leave poverty behind. Income inequality? Give us a break. God bless income disparity and those who have succeeded, and shame upon the OWS crowd who take us to task for our success and wallow in their own failure. Income disparity? Feh! That’s rather easy for someone perched at the top to say. But tell that to anyone whose job has been shipped overseas in the new global market, or to one of the 12+ million unemployed Americans and they might just tell Mr. Gartman where he can stick it. Tone deafness is the least worrisome trait of the über-wealthy. Particularly in the financial sector, there is a dangerous arrogance and instant dismissal of anyone who suggests that the industry cannot be trusted to police itself. “Government regulation slows growth,” is the common retort from Wall Street when tighter regulation is suggested. This not only shows the double standard—government intervention is bad when they want to regulate us, but we’ll gladly take their bailout money—but it also is revealing of the cultural divide. The investment community has fully recovered from the financial crisis they created and are ready to charge forward while much of the rest of America is still suffering its effects. And when Wall Street says “growth,” they’re talking primarily of investment growth, which is less persuasive to people who don’t have gobs of money to invest and are just waiting for the jobs to return to their town. On top of the impact of the recession (due in part to deregulation), the twin revolutions of globalization and technology have caused a hollowing out of the American middle class. From the industrial revolution through the latter half of the 20th century, the job security of blue collar workers in the manufacturing sector was threatened by automation and then cheap foreign labor. With the technology revolution, white collar jobs are now threatened. But even scarier for America (and other western countries) is that global businesses are no longer dependent on the American consumer. The BRIC (Brazil, Russia, India and China) are the key expansion markets for global businesses. Which means that not only are American workers less important to global businesses, but American consumers are becoming less important as well. Which means global companies are less dependent on a middle class revival. The final negative impact of such a stark wealth gap is the conflation of fiscal power and political power. Again, Freeland gives a range of examples. In some countries, politicians are simply bribed. In others, like the U.S., the money goes through the laundering process of lobbyists and interest groups and the final determinant is the American voter. But regardless of the system, money is influence, and those with influence will naturally push for their interest. The risk is that those in power pass laws that slant the system even more in the favor of those in power. This is how a plutocracy becomes an oligarchy. So is there a moral obligation to “even the playing field,” as it’s sometimes called? And how might that be done? Freeland asks these questions but does not suggest a redistribution of wealth. Rather, she cautions against a system in which social mobility disappears—in which the wealthy, powerful few are able to, intentionally or not, pull up the ladders they used to climb to their positions. One of the greatest guarantors of social mobility is a robust, widely accessible and affordable education system, which is why a pillaging of public funding, for whatever reason, is so dangerous. There are all kinds of hot button, political litmus test issues wrapped up in the wealth gap. But regardless of political leanings, the fact is that income disparity today is at one of the highest points in the history of the world. That imbalance of fiscal power may be counterbalanced by our democracy, or it may prove to be a threat to our democracy. That is yet to be seen. 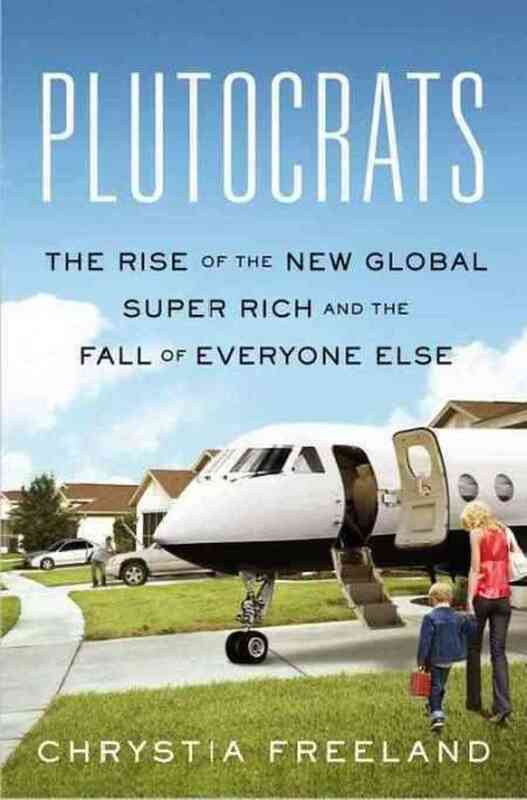 What Freeland gives us in Plutocrats is a fair, empathetic look at an elite culture and, more importantly, an informed analysis of the causes of the wealth gap, its implications, and some very important questions to consider about how it will impact us in the future.